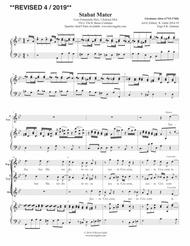 Composed by Girolamo Abos (1715-1760). Arranged by Kevin Galiè. Baroque Period, Sacred, Lent. Piano Reduction. 32 pages. Published by Kevin Galie' (S0.255711). Staggeringly beautiful Neapolitan women's chorus setting. 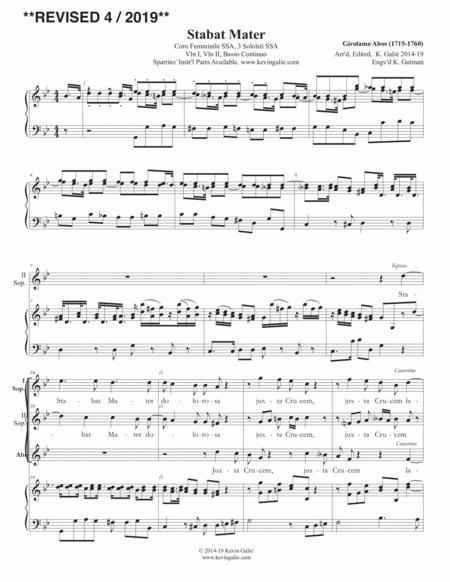 Manuscript suggests three solo voices, but the consistent layout of simpler ripieno melodic lines, interlaced with either echo or preceding lines of a clearly more virtuosic nature, seem to strongly indicate ripieno and concertino (three solo voices) treatment and performance practice.